My sister just reminded me that it is three years since our Dad died. I don’t have a good sense of time, I do have a good sense of loss that years don’t dull. After nodding our heads in wonder at the time that has passed we didn’t say much more about Dad. It was one of those times when words don’t work, our hearts held the moment. What we couldn’t find the words for is how losing a parent is something akin to having the ground disappear in front of you as you’re about to put a foot down. A wrenching step into an unexpected empty space, that’s how it was and how it is. I have a prolonged sense of desolation, a groundless feeling. I don’t know what she would say, but my sister might describe something similar. When somebody dies, the grief you feel is something that is largely endured alone, others may suffer the same loss but each experience is intensely personal. My Dad and my sister’s Dad were one person and the father each of us knew would, of course, be familiar to each daughter. Familiar and different, each with our own experiences and memories of ‘my’ Dad. He is the same man and he would be recognisable to both of us on an emotional level. It’s a bit like when we share memories or childhood, inevitably what is recalled with clarity by one has the other asking “Was I there?” We were created with the same genetic fabric though, it binds us together along with our brother and a third sister. 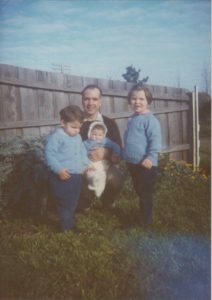 I love us all, we all miss our Dad, and I wrote this for one sister, the one who was at Dad’s hospital bedside three years ago, holding his hand. She’s the one who reminded me of this anniversary, what we share and who we remember.